In “Away With the Manger,” last week’s episode of the excellent “Judge John Hodgman” podcast, the case before the court of fake law dealt with a family divided over whether or not to display a nativity scene for Christmas. Marisa identifies herself as a “spiritual” person who was raised Catholic, and her husband Jay is an atheist and culturally Jewish. Hodgman, himself a “doubly-lapsed Catholic” (he is both the son of two lapsed Catholics and has lapsed on his own), brought very nuanced and thoughtful wisdom to a case which revolved around some very tricky notions of belief and divinity. Jay found it difficult to articulate exactly what it was about the crèche that made him uncomfortable. It was not simply the religious nature of the object, as he was fine with displaying the menorah that his mother has sent to him. Incidentally, both objects are, as decided by the court, equally tacky. He expressed the idea that it might be the figural nature of the nativity that disquieted him, in that it was meant to depict a divine figure directly. What neither the disputants nor the judge addressed was how the disparity in religious belief between husband and wife might be making Jay uncomfortable. I suspect that the importance that Marisa places on the nativity scene, informed by her belief that it to some degree accurately represents a person and event of ultimate importance, pushes the nativity out of Jay’s comfort zone. For her, the crèche approaches the status of a sacred object of devotion, and it is this relationship between person and thing to which Jay may actually be objecting. I say this as someone who, though irreligious and non-spiritual, lives in a house full of Christian imagery. My partner is like-minded, also has a degree in comparative religions, and she has long collected various representations of Jesus, Mary, and other biblical characters such as Judith (she who beheaded Holofernes). No one in this household attaches any transcendent meaning to them; for us they are cultural and aesthetic artifacts, nothing more. If, however, she attached spiritual significance to them, I would perhaps be uncomfortable in the same way Jay is. One way of looking at the difference is by imagining what might happen were the nativity scene to be destroyed. (Don’t worry, Marisa, I’m not advocating this! And by this point, “Marisa” and “Jay” have become archetypes more than the actual individuals.) 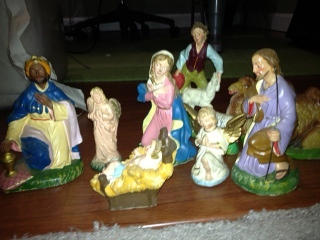 If Jay were to step on the baby Jesus, would it simply be a matter of angering Marisa and her grandmother who had handed it down, or would it be an act of blasphemy? Would Marisa’s feelings be hurt more because it Jay had destroyed something important not only to her and her grandmother, but also to God? Marisa’s valuation of the object comprises the material cost, sentimental value, and its religiously symbolic value. Jay’s valuation does not include the latter. Marisa experiences her relationship to the nativity scene differently from how Jay does, but Jay, as someone with empathy for Marisa, feels part of that relationship, which conflicts with how he sees the world. That tension produces the discomfort he could not quite explain. John Hodgman handled this case extraordinarily well. He usually manages to dispense actual wisdom in the trivial or absurd cases brought before his court, but in this case, he displayed a cogent understanding of the very real problem of why the religious and irreligious often fail to communicate effectively. ← No Solemnity Without Religion; or, Why Can’t Atheists Perform Weddings?